JP McManus bids to build on Edwulf's remarkable Irish Gold Cup win last Sunday when the Limerick owner makes a three-pronged attack at tomorrow's Betfair Hurdle at Newbury, led by the Willie Mullins-trained Bleu Et Rouge. 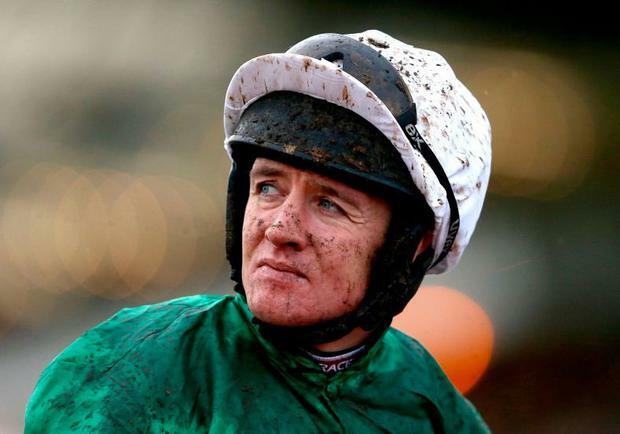 Mullins' charge - fourth in a competitive hurdle at Ascot on his last run - is the sole Irish runner in a maximum field of 24 and will carry 11st 10lb with McManus's retained rider Barry Geraghty in the plate. With more than €100,000 on offer for the winner, Bleu Et Rouge (12/1) takes his chance while McManus is also represented by Nicky Henderson's Charli Parc (33/1) and the John Quinn-trained Project Bluebook (40/1). UK champion trainer Henderson has a quintet of runners including Jenkins (12/1) - which has been a revelation since blinkers were added, winning his last two races and has the benefit of teenage wonderkid James Bowen taking 3lb off his back - as he sets his sights on a sixth Betfair Hurdle success. Another Seven Barrows representative is Verdana Blue (10/1), an interesting mount for Irish jockeys' championship leader Davy Russell, with Irish Roe heading the market at 8/1 for pig farmer Peter Atkinson, a permit-holder with just two horses in his yard. Closer to home, the Irish Jockeys Association have expressed disappointment with a lack of consultation during the negotiations that have resulted in At The Races being replaced by Racing UK as the main broadcaster of Irish racing from January 2019. Secretary Andrew Coonan said: "Anything that's going to enhance the value of the racing product is going to benefit riders, but this deal, at this point in time, lacks the clarity, or any degree of certainty with regard to scheduling, and that could create problems for riders here." Meanwhile, Stuart Edmunds has been given the all-clear to step up the training of his smart hurdler Maria's Benefit for next month's Cheltenham Festival after an injury scare. His multiple-winning mare - vying for favouritism in the Mares Novices' Hurdle market with Mullins' Laurina - was found to have heat in a knee but a precautionary X-ray has come back clear and it's all systems go for Cheltenham with the tough mare, which completed a five-timer in the Grade Two Yorkshire Rose Mares' Hurdle at Doncaster last month. "I've just had the results from the vet. They are all happy with the knee. There was a bit of heat in it, but they are happy for us to progress with the work and just keep icing the knee. "Fundamentally she seems fine and her work will now increase ahead of Cheltenham," a relieved Edmunds said. Elsewhere, the betting ring is set to lose one of its longest-standing and most-respected members with David Power, leading course bookmaker and co-founder of Paddy Power, set to retire after next month's Festival after more than 50 years on the rails.